As an Ammunition Technician, you are in charge of keeping the Defence Force armed. You will be responsible for the inspection, bulk storage and maintenance of all ammunition and explosives used by the Navy, Army and Air Force. You will also conduct technical trials on new ammunition, conduct investigations into ammunition accidents, and dispose of unserviceable ammunition or ammunition which has become obsolete. Ammunition Technicians are also responsible for keeping Defence Force training areas free from unexploded ordinance, by safely removing and disposing of malfunctioning ammunition. The core capability of an Ammunition Technician is to ensure ammunition arrives in the correct quantity, type, place and time. As you are dealing with explosives it is critical the ammunition is safe and reliable for our personnel to use. You will be trained in the safe and effective storage, inspection, maintenance and disposal of all the different explosive ordnance used by the Defence Force and other allied agencies. You will assist in the disposal of malfunctioned ammunition (if it occurs within military training areas) and of obsolete ammunition stocks, either by burning or detonation. As part of the technical evaluation process, Ammunition Technicians often attend live firing activities of various types of Infantry and Artillery weapons to ensure the ammunition is performing as designed. As you become more experienced, you will assist in training other Defence Force personnel in ammunition safe handling, movement and disposal. Ammunition Technicians also deploy overseas in support of exercises and operations. Wherever our Army has an international presence, we need Ammunition Technicians. Recent deployments include Iraq, East Timor and Afghanistan. As our Defence Force increases the amount and variety of training it conducts with other nations, there is an increasing demand for qualified Ammunition Technicians to provide technical advice, and to ensure our ammunition and explosives remain in a safe and usable condition. I have a passion for explosives and ammunition. Some of the bulk demolitions that we do in Waiouru definitely get up in scale. 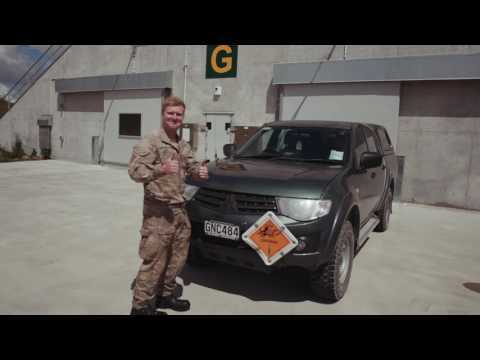 As you are promoted in rank and gain more technical experience and knowledge in the trade, there are a variety of different job opportunities you can take up within NZ Army and wider Defence Force. These include operational deployments overseas, and participation in major international exercises or military exchanges. You can be posted to any of the three Defence Ammunition Depots in Christchurch, Waiouru and Auckland. And you can expect to be posted a Logistics Battalion in either Linton Camp (near Palmerston North) and Burnham Camp (near Christchurch), or as an instructor at the Defence Explosive Ordnance School (DEOS) in Trentham Camp (near Upper Hutt). On this course you will learn about how to handle, store and transport different types of ammunition. On completion of your RNZALR Basic Course you will begin your trade training. The Primary Course teaches you the basic technical theory and mechanical and scientific functioning within all natures of ammunition, including Navy and Air Force ammunition and explosives. You will be trained to certify ammunition and explosives, to ensure they are safe to move by road, rail, sea and air. You will also learn how to safely make up basic explosive charges, and gain experience in warehousing, occupational safety and health, movement of hazardous goods, and other essential logistical functions. On successful completion of this course you will be posted to the Defence Ammunition Depot in Waiouru to consolidate your knowledge with practical, hands on continuation training. conduct logistics disposal of EO. If you are selected, this course will train you to manage a NZDF Explosive area and a Unit Explosive Ordnance Facility. Additionally, you will train in how to supervise technical tasks in an ammunition depot, or in a field setting supporting Defence Force training, exercises or operations.